Voice commands are becoming an increasingly popular way to shop for food, experts say. Walmart customers in need of groceries have had two options in recent years: Go to the store and fill up a shopping cart by hand; or select food items online and have them delivered to their home or picked up in person. Beginning this month, customers who own a Google assistant can say, “Hey, Google, talk to Walmart” to add items to a virtual grocery cart, Tom Ward, senior vice president, Digital Operations, Walmart U.S., said in a statement Tuesday. The voice commands allow customers to add items to their cart one at a time over a few days — not necessarily to complete their shopping for the week all at once. As the technology becomes more familiar with customers’ shopping habits, Ward said, it will improve over time. Walmart has been investing heavily in food sales in recent years. The company has begun selling organic produce, as well as creating “designer" fruits that offer particular flavors year round. Food sales make up more than half of Walmart’s revenue, nearly $200 billion worth of groceries each year, experts say. 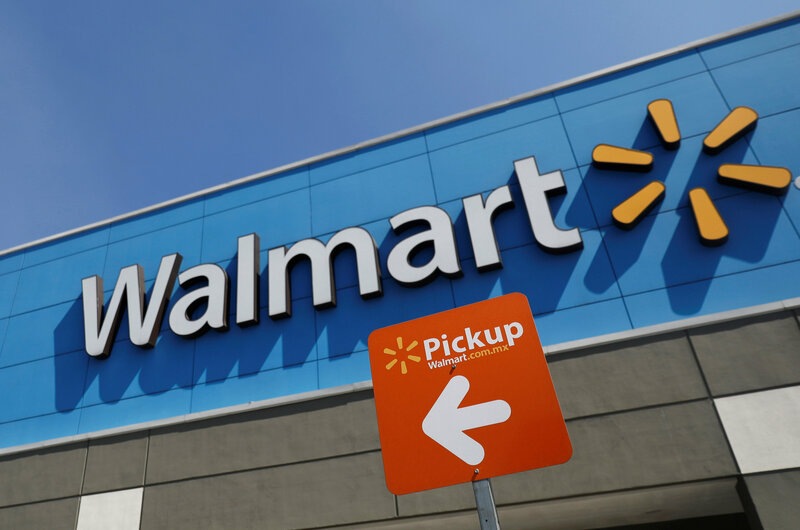 Walmart’s new service is available only in locations that offer store pickup (2,100 locations) and delivery (800 locations). Citing estimates from the research firm Cowen, CNN reported that about 13 percent of Walmart shoppers take advantage of curbside pickup. Seeking to improve the shopping experience of busy customers, grocery chains continue to experiment with new technologies designed to enhance convenience. In December, Kroger — the nation’s largest grocery chain — announced that customers could have their groceries delivered by an autonomous vehicle with a design inspired by a Formula One racing helmet. This year, Robomart — a Santa Clara, Calif.-based start-up — announced plans to unleash an on-demand, remote-controlled “grocery store on wheels” that would allow customers to shop for groceries in front of their homes. In January, Robomart founder and chief executive Ali Ahmed told The Washington Post that he hopes to partner with other retailers that would lease its vehicles and brand them as their own, creating self-driving grocery fleets. To keep up with autonomous delivery vehicles and voice assistant shopping, Walmart has no choice but to “jump on the voice train to compete effectively,” according to Paul Michelotti, the Experience management practice lead at the digital marketing company Avionos. Peter Holley is a technology reporter at The Washington Post. Before joining The Post in 2014, he was a features writer at the Houston Chronicle and a crime reporter at the San Antonio Express-News.